By LUDWIG VON KOOPA - Canadians need not apply. 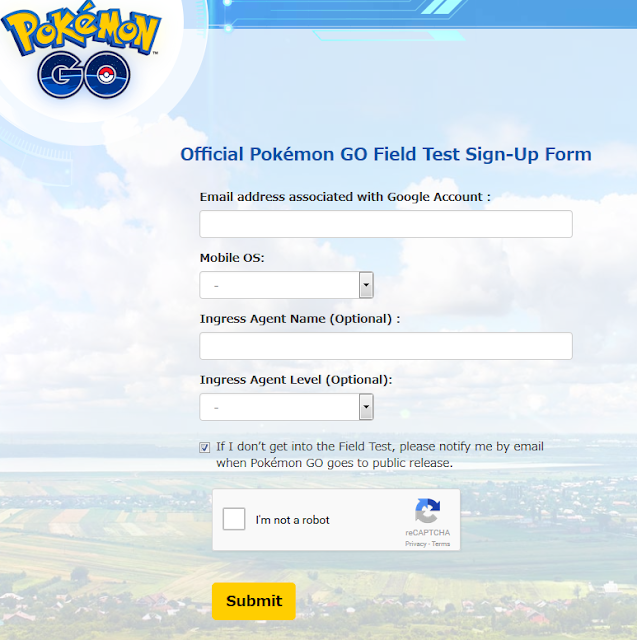 If you live in Australia or New Zealand and wanted to participate in the beta for Pokémon GO, you missed your chance. That's a bummer for the ~1% of people from the Oceania area who read this site (including Health), but hopefully Niantic Labs and The Pokémon Company's own marketing efforts reached you. ...Well, you might still have a chance to get in. You'll be late, but I guess they don't say you can't get in at this point with a late invitation. But if you live in the United States? Now's your chance to sign up! Right here! So, say you become a tester. You want to share what you know with KoopaTV in a guest post? Well... that'd violate your confidentiality agreement. So don't do it, though we'd give you the maximum amount of points in the KoopaTV Loyalty Rewards Program assuming we don't get a cease and desist notice. (And if you do it, you're responsible for legal consequences, not us.) That's why we haven't heard about Pokémon GO despite there being field tests from it. ...And if there are leaks, they get clogged up pretty quickly and the leakers have their heads bashed in. See? 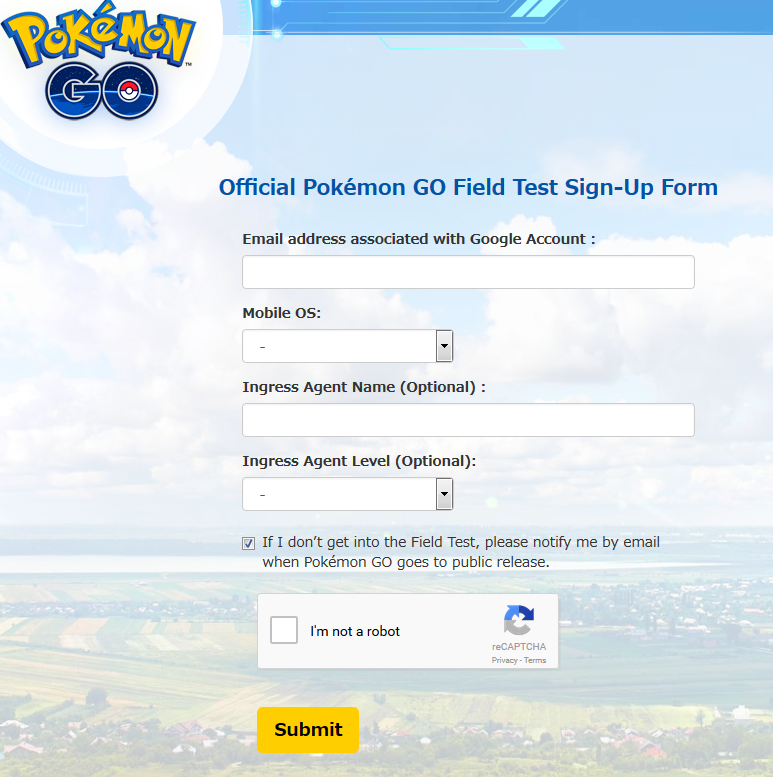 The sign-up form to get picked for the Field Test is easy. Though, they'll make you give them a bunch more information if you get picked. You must also be the only one playing it. And your progress might get wiped out at any time, so it obviously won't transfer. Hey, that's the rough life of participating in a beta. What are your chances of being picked? It depends on your OS type, region, augmented reality experience (I assume they want a mixture of both experience and non-experience), and luck. Mostly luck. The experience level is measured by whether or not you've played Ingress, which is Niantic's previous mobile game. You probably have a better chance of seeing a shiny Pokémon in the wild than getting picked. Probably. Ludwig won't submit anything because he doesn't even want to pretend he has a mobile OS. You might as well, though, since it's a free submission. KoopaTV also makes games, by the way. You're welcome to volunteer to beta-test those. And the process for being picked for that isn't dependent on an RNG. For more information about Pokémon GO as a game, read this explanation. Forget testing. The game is out. Poor Oceania always get the short end of the stick. To whoever that one reader was, my sympathy goes to you. At least they actually do get to participate. The guy from Alberta is pissed off about that.